Fiona Shaw's 2011 production of Mozart's Le nozze di Figaro (The Marriage of Figaro) returned to the London Coliseum for its second revival on 29 March 2018, with Peter Relton as revival director. English National Opera assembled a fine young cast with four role debuts, Lucy Crowe as the Countess, Ashley Riches as the Count, Rhian Lois as Susanna and Katie Coventry as Cherubino and they were joined by Thomas Oliemans as Figaro, Janis Kelly as Marcellina, Keel Watson as Don Bartolo, Colin Judson as Don Basilio, Alasdair Elliott as Don Curzio, Alison Rose as Barbarina and Paul Sheehan as Antonio. Martyn Brabbins conducted, and the opera was sung in Jeremy Sams' translation. Peter McKintosh's sets are abstract and relatively neutral, but Steven Williams' video projections and McKintosh's use of skulls of horned bulls throughout the set hint at interesting concerns. In an interview in the programme book, Fiona Shaw talks about the idea of a maze with the Count as the minotaur at the centre. I have no idea how much of what we saw on Thursday was Shaw and how much Relton, but the production did not push the concept too hard. Costumes were 18th century, largely, and the basic setting was period, but with more modern touches (an early 20th century vacuum cleaner for instance!). Again in the article, Shaw talked about the necessity of the period to provide the right framework for the droit de seigneur, the engine which drives the plot. Within the abstract set, on a revolve, we saw all the elements of a busy household. Servants were ubiquitous and ever present, and the revolve was used creatively to allow the cast to walk through the house, so that Susanna and Marcellina's duet in Act One takes place in the context of a furious walk through a house full of servants engaged in activities. Certainly this production must keep the props department busy, but it was never too much and ensured a nice liveliness to the production. Also, it meant that the cast were usually singing well down-stage, which is a great advantage in this auditorium, and certainly there was no problem with these young voices taking control of the auditorium. This was a well thought through production, all the various details of the complex plot worked neatly. 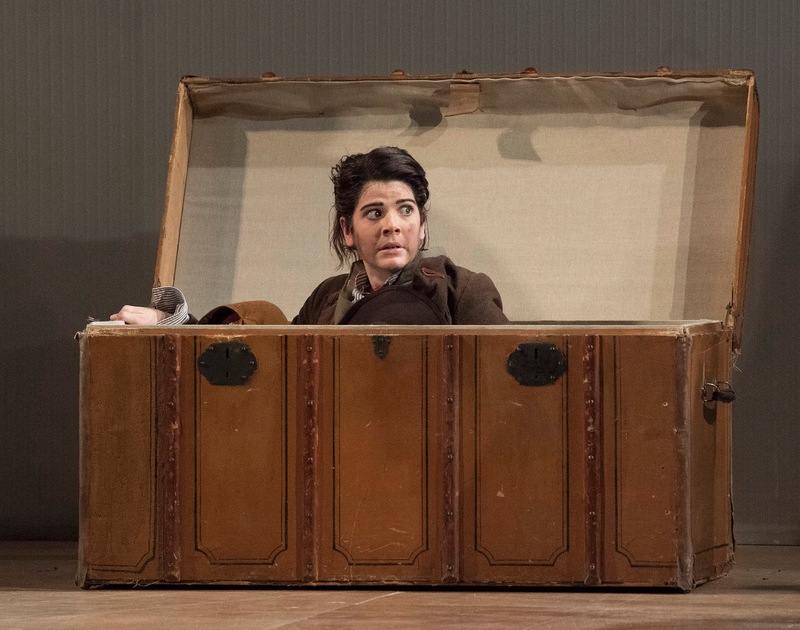 There were some interesting ideas; making Don Basilio blind meant that the logistics of some of the more farcical Act One moments worked very well, as did hiding Cherubino in a chest. Having Susanna somewhat tipsy in Act Three meant that her bravery in speaking up against the Count was a little more believable than usual. And the final garden scene, which takes place in the darkened 'maze' worked well partly because of the lack of naturalism so we worried less about the fact that the characters could see each other, but still here the disguises for Susanna and the Countess were well planned and believable. Yet all this was only framework, and what the production achieved was a lively and engaging tone, some vibrant performances with some powerful and touching moments. And it was all very funny. 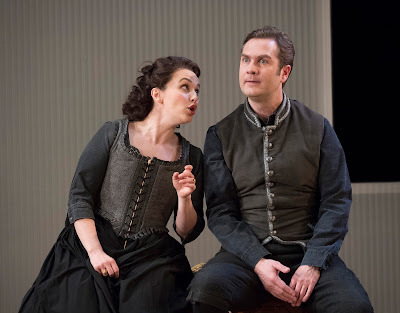 With so many role debutants, it would have been fatally easy for Thomas Oliemans' Figaro to dominate, but instead Oliemans turned in a beautifully crafted ensemble performance. This was a very human Figaro, yes there were moments of anger such as the Act One aria reminding us that Beaumarchais' original had much talk of liberty, and though he was jealous in Act Four it was not overhelming, so that Oliemans account of the Act Four aria was profoundly moving. But throughout there was a lovely sense of humanity and fun, alongside a vein of seriousness. And his sung English was excellent and perfectly comprehensible. In fact, all the cast's diction was good, it helps that Jeremy Sams translation is witty and singable without being too modish. And I rather wished that the opportunity had been taken for some performances without surtitles. 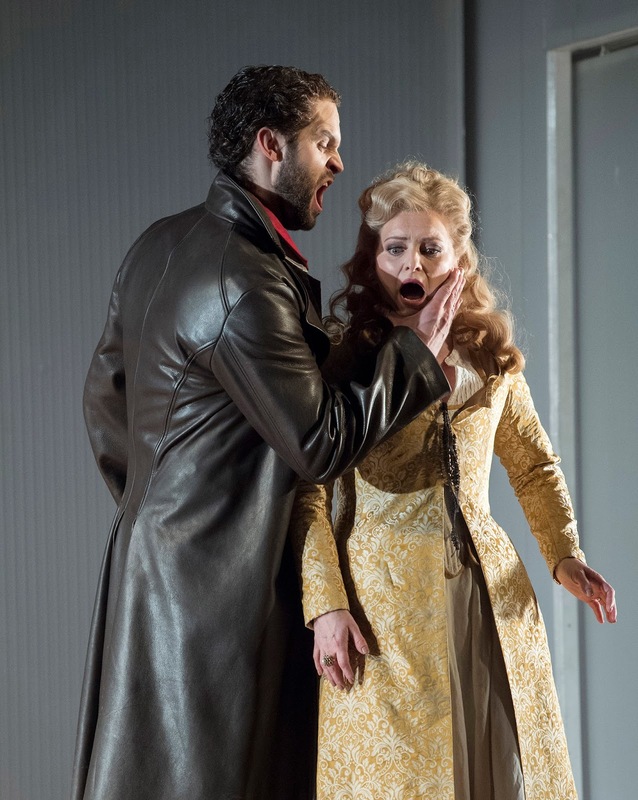 Rhian Lois has already been singing Barberina in this opera and Zerbinetta in Don Giovanni, and has now made the move to Susanna. She is a lively artist, and there was no doubt that her Susanna was in charge, yet always with a twinkle. But, matching Oliemans performance, there was a vein of seriousness too and a nice intensity, these were real people and what was happening really mattered to them. She and Oliemans developed a nice, believable interaction and her aria in Act Four was beautifully sung. There were perhaps moments when the voice did not quite fill the auditorium, but this was a fine debut and certainly a role which she can cherish. One of the enjoyable aspects of the production was its sense of hierarchy, it was clear not only that the Count and Countess were the aristocrats, but also that Figaro and Susanna were in the position of highly privileged servants, subservient to their master and mistress but dominating the lower ranks of servants. Something that many productions omit, but which is important for the logistics of the plot. Having just the right dominating physique for the role Ashley Riches did not have to bully and act the martinet to create the right effect as the Count. His Count was believably aristocratic, along with a nice sense of entitlement, it clearly never really occurred to him to question what he was doing. Like Don Giovanni (a role which Riches debuted last year at Opera Holland Park, see my review), the Count's arias contribute less than his interactions with others, and Riches gave us a beautifully three dimensional portrait, so that his behaviour never tipped over into the extreme and there was always a facade to put on. Riches and Lucy Crowe developed a nicely complex relationship between the married couple, you sense the attraction as well as the problems. And Riches really was seductive, which helps enormously. The moment a soprano moves from Susanna (a role which Lucy Crowe has sung extensively including at the Royal Opera House) to the Countess is always fascinating. Crowe's voice has developed a darkness and richness, though this was not a performance which reveled in the luxuriance of the voice, Crowe's trademark plangent sense of line was still there. And this was combined with a remarkable nervous intensity, this Countess was nearly always wound up and this intensity showed in every gesture, physical and vocal. This meant that her two arias became vivid pictures of a mind in distress. She was also clearly very, very tempted, not only with Cherubino, but with one of the other servants. And it was the Countess who was the subject of the production's most radical gesture. At the very end of the opera, she reappears in contemporary clothing (with other members of the cast's outfits also discreetly modernised), complete with a suitcase. In a beautifully poised and touching performance, Crowe's Countess forgave her husband, embraced him but then walked away, leaving him puzzled and distressed. A very modern solution. Katie Coventry made a delightful Cherubino, slight and vivacious, this young man had plenty of energy combined with a wide-eyed naivety which was engaging. Cherubino had not, yet, had his belief in the world knocked out of him. This was a very active account of the role, and Coventry is a gifted comedian, both physically and in the use of facial expressions (those wide eyes). But she sang 'Non so più cosa son' beautifully, with an engaging urgency. Janis Kelly and Keel Watson made a fabulous double-act as Marcellina and Don Bartolo, both are fine comedians she with a range of physical gestures and he with a glorious selection of facial expressions. Yet both made us care for the characters underneath. This wasn't just farce, both helped reflect the humanity of Mozart's music. I loved their reactions in the Act Three sextet, when they realise that Figaro is their son, and in fact this performance of the sextet (Mozart's favourite piece of the opera) was one of the funniest and most touching that I have seen. 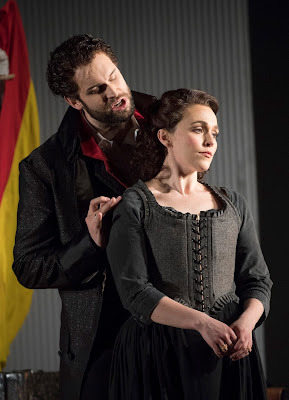 As ever with fine artists in the roles of Marcellina and Don Bartolo, I regretted that omission of the Act Four arias though understand how they do hold up the action. Alison Rose was a charming Barbarina, characterful rather than pert, and Paul Sheehan gave a lively account of Antonio's role, including the drinking. Colin Judson and Alasdair Elliot made the most of their opportunities as Don Basilio and Don Curzio. The chorus does not, strictly, have that much to sing in this opera but Fiona Shaw's production makes the servants work hard so that all created just the right feeling of that busy household near Seville. In the pit, Martyn Brabbins drew crisply lively playing from the orchestra in the overture, this fair crackled with excitement. It wasn't period performance, the string tone had more weight than that, but nor was it a richly romantic one. The instruments provided a lively and vividly engaging counterpoint to the activity on stage. 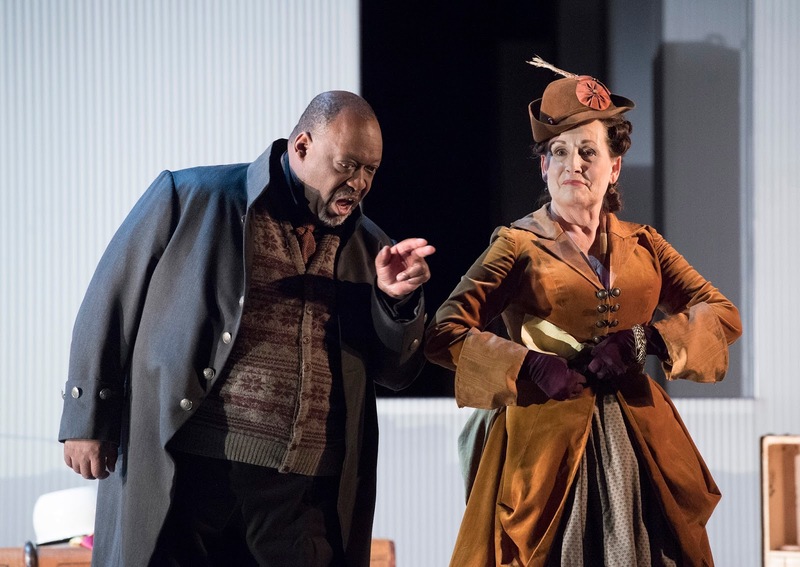 This was a strong revival, and exactly the sort of performance ENO should be doing with a finely balanced cast combining experience with youth and giving opportunity to an array of British artists with just a dash of visiting guest to spice things up. There are only five more performances (from 4 to 14 April) so hurry along to see it. As is usual, Robert, your review is spot on. This is one of the best productions of M of F that I have seen; unlike some productions which leave one scratching one's head and wondering what's going on, this was a clear narrative. It was also very funny, and it was good to hear the audience roaring with laughter. Wonderful singing all round, with not a weak link, and the diction was exemplary. Surtitles were not really needed. I'm sorry but we saw this tonight and what a disappointment. For a start is was visually boring and what should have been a rowdy comedy turned out to be anything but. The two main male characters namely Figaro and the Count were poor. Certainly the Count bored you to tears with his stomping and lack of acting ability and Figaro failed to play to the audience. The saving grace was the Countess with her exquisite voice Sussana with an overall superb performance Marcellina was a refreshing jolt to this production as was Barberina. The production felt amateurish and in all honesty we were glad when it ended. The score on the door should have been a 2.5 nothing more. It is always interesting to find how different people react to the same show, even the same performance. But then that is part of the fascination of live performance and I have been to plenty of shows where we hated it and read glowing reviews!